Significant changes were needed after the UK Supreme Court struck down the information sharing provisions at the heart of the Named Person scheme. But has the Scottish Government done enough to address the issues? NO2NP puts the Children and Young People (Information Sharing) (Scotland) Bill to the test. The UK Supreme Court ruled that the Named Person information sharing provisions were not “in accordance with the law”. The legislation breached the rights of children and families under Article 8 of the European Convention on Human Rights. The Scottish Government managed to pass legislation which was not legal! A big problem to solve. So what has been done to make things right? In a word, not enough. Judges said: “changes are needed both to improve the accessibility of the legal rules and to provide safeguards so that the proportionality of an interference can be challenged and assessed” (emphasis added) (para. 107). But this new Bill has failed to resolve these issues. Anybody trying to understand what the law is will have to simultaneously consider several separate pieces of complex legislation: the Children and Young People (Scotland) Act 2014, the Data Protection Act 1998, the Human Rights Act 1998 and the Draft Code of Practice, as well as the new General Data Protection Regulation (GDPR). This does not sound very accessible! How can busy practitioners, those expected to carry out the role of Named Persons who are unlikely to have legal qualifications – particularly teachers and health visitors – be expected to negotiate this area with enough certainty to know that they are able to share information when the rules are spread out across at least four pieces of legislation? As for providing safeguards against unlawful interference, the Scottish Government has taken a step forward, but the situation is still confusing. It has the opportunity to put proper, clear safeguards on the face of the legislation, and it should do so. The UK Supreme Court also said that the Scottish Government had to make clear that advice from the Named Person is entirely voluntary. However guidance is not law. So it’s doubtful that the words about the voluntary nature of the scheme would carry sufficient weight with parents unless it is on the face of the legislation. Many parents remain unconvinced by the Government’s ‘voluntary nature’ rhetoric, and would prefer a proper ‘opt-out’ to ensure their personal information is not being shared and actions not taken without their full knowledge and informed consent. The Scottish Government has done nothing to address the “notably vague” definition of wellbeing as identified by the UK Supreme Court. The wellbeing threshold is the driving force of the Named Person scheme. Without a clear definition it will be difficult for practitioners to know what is proportionate and in accordance with the law, leaving individual families at risk of having their human rights breached. The Faculty of Advocates has also warned that the Scottish Government’s proposed changes don’t go far enough to meet the Supreme Court’s concerns. Clan Childlaw, a leading children’s legal charity, expressed concern that the Scottish Government’s revised Named Person information sharing legislation wouldn’t fix the issues raised by the UK Supreme Court. In its written evidence to the Scottish Parliament’s Education and Skills Committee that the bill “fails to overcome the difficulties identified by the Supreme Court, in relation to lack of precision and accessibility, and lack of safeguards and consent”. We hope the Deputy First Minister and his team will take heed and listen to the serious concerns being raised, so that they are not forced back to the legislative drawing board… again. It was “The aim of… the promotion and safeguarding of the wellbeing of children and young persons” that was benign, not the Named Person. “…the sharing of personal data between relevant public authorities is central to the role of the named person … the operation of the information-sharing provisions of Part 4… will result in interferences with the rights protected by article 8 of the ECHR” (para. 78). “It is thus perfectly possible that information, including confidential information concerning a child or a young person’s state of health (for example, as to contraception, pregnancy or sexually transmitted disease), could be disclosed… to a wide range of public authorities without either the child or young person or her parents being aware of the interference with their article 8 rights” (para. 84). “We conclude therefore that the information-sharing provisions … as currently drafted do not meet the article 8 criterion of being ‘in accordance with the law’.” (para. 85). The Supreme Court said the confused drafting of the law created “very serious difficulties” for anyone attempting to understand or implement it and expressed “even greater concern” about “the lack of safeguards” [Paragraphs 83-84]. Because of the lack of safeguards “the overriding of confidentiality is likely often to be disproportionate” (para. 100). “…the information-sharing provisions of Part 4 of the Act are not within the legislative competence of the Scottish Parliament” (para. 106). “…since the defective provisions are not within the legislative competence of the Parliament, they cannot be brought into force” (para. 109). After losing the case, the Scottish Government asked the court not to force them to pay their opponents legal costs. They claimed they had only lost on a “relatively limited ground”. The Supreme Court rejected this argument and ordered them to pay all the costs of the case. Clearly the Supreme Court did not think the Named Person was “legitimate and benign”. Information watchdogs have been criticised over disparaging comments made in emails when the Scottish Government lost the Named Person legal case. A senior Information Commissioner’s Officer (ICO) official admitted to a colleague in Scotland she hadn’t “the foggiest” what the historic court judgment was about. The official, employed in the Cheshire headquarters of the ICO, went on to say that she didn’t have the “time or inclination” to read the decision of the UK Supreme Court, despite it being the biggest ruling affecting the ICO’s work since the Prince Charles letters case. In response, her colleague David Freeland, a Senior Policy Officer at the ICO’s Edinburgh office emailed back saying: “I don’t particularly blame you”. He also disclosed that the ICO was aware they could get complaints about information breaches following the ruling. He wrote, “we may get complaints that non-statutory pilot schemes were either sharing personal information unlawfully by lacking sufficient conditions for processing, or disproportionately”. In 2014 Mr Freeland controversially told a seminar on information sharing not to offer parents the chance to object to the sharing of private information on them and their children: “Consent is not the be-all and end-all”, he said, lamenting that “Consent can be difficult and it should only be sought when the individual has real choice over the matter”. 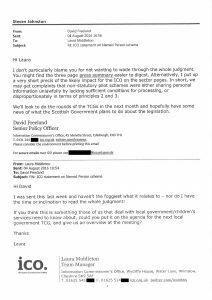 The internal emails, revealed in a recent Freedom of Information (FOI) request, also disclosed concerning comments from the head of the ICO in Scotland, Ken Macdonald, who expressed his “disappointment” after judges struck down the Named Person scheme’s intrusive information sharing provisions. The ICO is responsible for protecting the privacy of citizens and upholding the Data Protection Act – the very law the Supreme Court said was breached by the Named Person provisions. “The attitude on display here is breath-taking. Are these people so out of touch with the concerns of ordinary families? 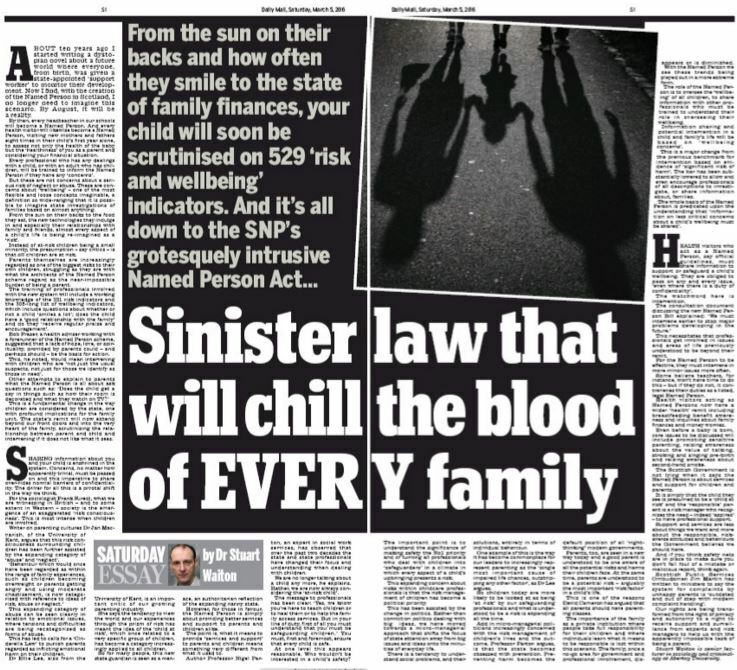 There’s been massive public anxiety about the Named Person data sharing, yet they say they are ‘disappointed’ when the Supreme Court sides with families and upholds the Data Protection Act. “The ICO as an independent body has been entrusted to uphold information rights, oversee data protection and investigate complaints from members of the public. Yet here we find ICO officials behaving in a most dismissive manner about a court case which goes to the heart of their work and has profound implications for personal privacy and data protection. It may be the most important case on Data Protection that Scotland has seen, yet officials charged with Data Protection in Scotland don’t seem to think it’s important enough for ICO officials to even bother reading. 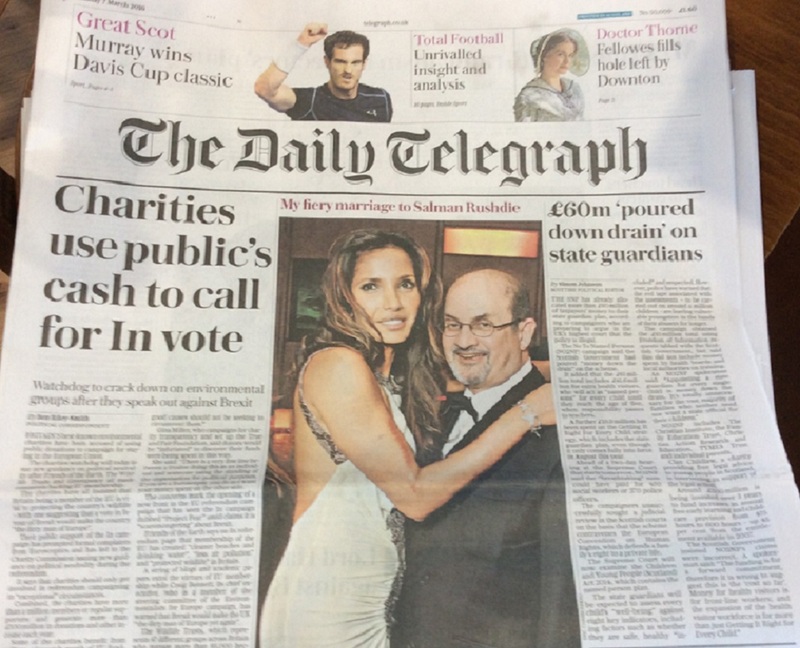 “The comments by Ken Macdonald suggest the ICO is only paying lip service to the idea of being an independent body. They say they are disappointed with a court ruling against the Scottish Government in an action brought with the backing of thousands of ordinary mums and dads concerned about their family privacy. If they were truly independent they would simply accept the ruling. “The ICO got the law wrong. They failed to protect the public. They should have warned the Government, not collaborated with them. In the wake of the recent court decision to award legal costs against the Government, Mr Macdonald might wish to revisit his views. The dismissive email exchange between Cheshire-based Laura Middleton, ICO Team Manager, and David Freeland, ICO Senior Policy Officer in Edinburgh, took place on August 4, after they’d heard about the Supreme Court decision. 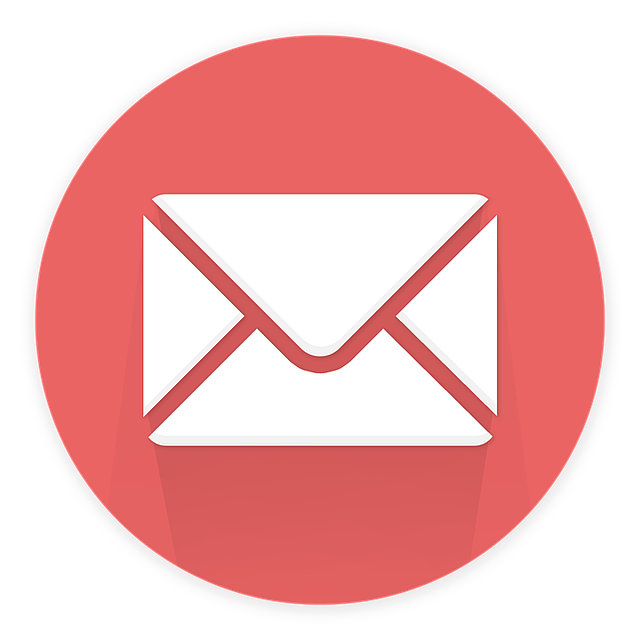 The ICO is the UK’s independent body set up to uphold information rights and also oversee complaints about freedom of information requests. 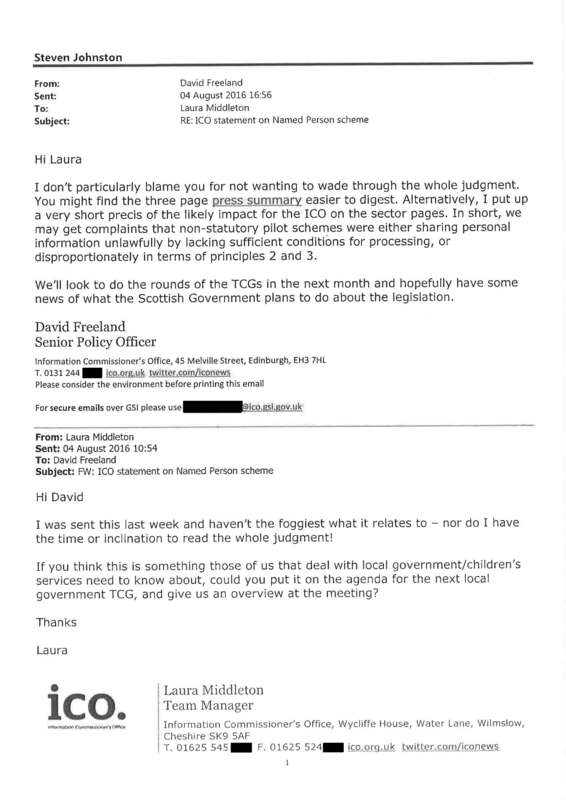 Ironically, the emails about the Named Person scheme were obtained by a Freedom of Information request forcing the ICO to make public all their emails on the subject. The response also reveals there was concern within the Scottish Government before the judges banned them from implementing the Named Person scheme. Scotland’s ICO chief clearly did not understand the ruling, or even how Parliament operates. The “six weeks” was the time given by the court to allow the parties to make submissions to the court over costs and other issues. It would have been impossible to reconvene Parliament from its summer break and pass new legislation in six weeks. “What we can see here is anything but independence. This is a one-sided attitude, determined to stand by the Government line, with little regard to the needs of the public or even the actual demands of the law. The Scottish Government has repeatedly tried to claim the Named Person Supreme Court legal challenge failed, even though judges stated that they “unanimously allowed the appeal”. Now the UK’s highest court has ordered the Scottish Government to pay the legal bills incurred by those who brought the court case, in yet another humiliating ruling for ministers. The costs for the petitioners, who are all part of the NO2NP campaign, are estimated to top £250,000. The Scottish Government’s own bills will also be substantial, possibly bringing the total to around £500,000. “The Government has been hammered on costs. This is a total and utter vindication of the legal action that we were involved in, and underlines how deeply flawed this illegal scheme was. “The Scottish Government argued we should pay our own costs. But the judges disagreed, awarding us our costs, further proving that we have been right all along. 42 days are almost up… What is Section 102? Many have been asking what will happen when the 42 days proposed by the UK Supreme Court comes to an end and what exactly is the Section 102 order. (b) suspending the effect of the decision for any period and on any conditions to allow the defect to be corrected.. Section 102 is a mechanism that allows for the suspension of the effect of a court’s decision to strike down a piece of legislation while the problems with it are sorted out. This is a rarely used constitutional power. Section 102 was intended to be used in cases where the court is proposing to declare a statutory provision which is already in force to be unlawful. In order to avoid resulting chaos from striking down the law, they give the executive a period in which to fix it, while allowing the unlawful law to remain in force and effect. In this case, the law is not in effect and the UK Supreme Court has declared that it cannot be brought into effect. However, section 102 could allow the UK Supreme Court to keep a supervisory role in settling any replacement legislation. The 42 days cited in the judgment are for the parties involved in the legal action to make submissions on whether or not the UK Supreme Court should use its section 102 power. At the conclusion of the submissions, the Court could maintain a supervisory role over the Scottish Government/Parliament, given them a period to change the law and guidance into what the Scottish Ministers think to be a Convention compatible form and then re-present this to the court for their approval. It is certainly not expected that the necessary legislative/guidance changes will be presented to the court within the 42 day period mentioned in the judgment. Judges at the UK Supreme Court have declared the Scottish Government’s ‘state snooper’ Named Person scheme to be illegal. The controversial legislation has been condemned for breaching the human rights of families. It is the first time the Supreme Court has prevented a major piece of legislation passed by the Scottish Parliament from coming into force. 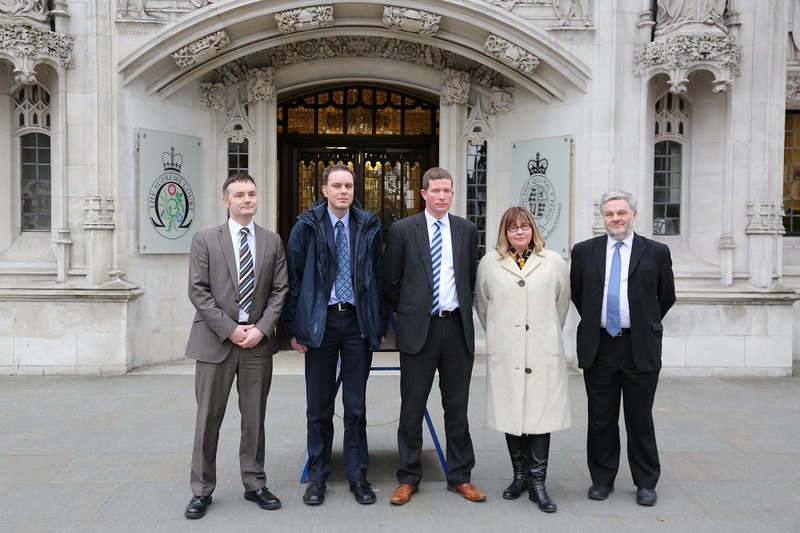 In a historic verdict, five of the UK’s most senior judges, including two Scots, unanimously overturned decisions by the courts in Edinburgh on the legality of the Named Person provisions of the Children and Young People (Scotland) Act 2014. The judges branded the law “defective” for breaching article 8 of the European Convention on Human Rights (ECHR), which guarantees everyone’s “right to a private and family life”. They declared Holyrood had exceeded its powers by making a law which allowed public bodies to share sensitive private information about children and parents without consent. “The sharing of personal data between relevant public authorities is central to the role of the named person … the operation of the information sharing provisions will result in interferences with the rights protected by article 8 of the ECHR” (Para. 78). Because of the lack of safeguards “the overriding of confidentiality is likely often to be disproportionate” (Para. 100). “We are delighted with the decision, which proves our concerns, and those of the 35,000 people who signed our petition, were properly founded. “This proposed scheme was intrusive, incomprehensible and illegal. “The child is not the mere creature of the state” (Para. 73). To read the judgment or see the hand down visit the UK Supreme Court website. The UK Supreme Court has announced it will hand down its Named Person judgment on Thursday 28 July at 9:45am. The judgment in the case, which is listed as “(1) The Christian Institute and others (Appellants) v The Lord Advocate (Respondent) (Scotland)”, will be streamed live on the Supreme Court website. The fight to oppose the Scottish Government’s Named Person legislation continued to the UK Supreme Court after judges in Scotland’s highest court ruled last year that the legislation did not conflict with human rights or data protection laws. A two-day hearing involving five judges took place in the Supreme Court on the 8th and 9th March. Judges hearing the Named Person legal challenge in the UK Supreme Court today have been told that doctors prescribing the contraceptive pill to teenage schoolgirls would have to inform the pupil’s head teacher under the Named Person legislation. But the girl’s parents on the other hand would have no such right to know. 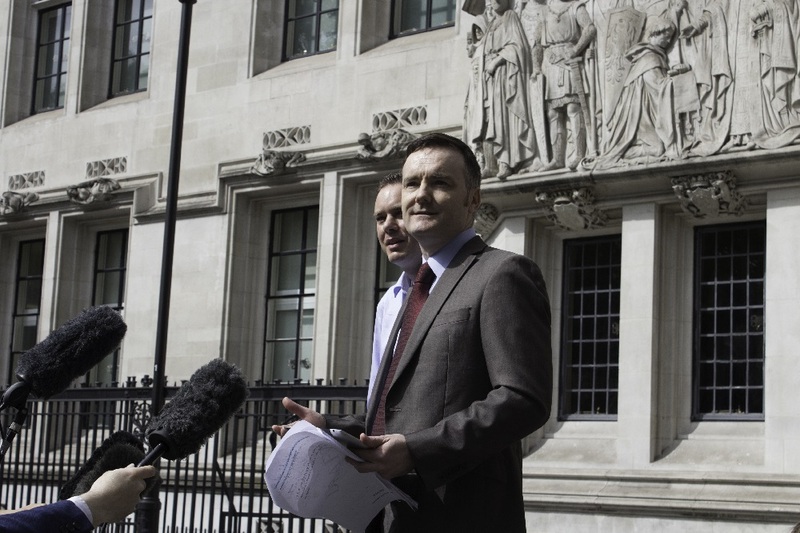 Aidan O’Neill QC, representing those opposing the scheme, told the five judges hearing the case that a GP would not be bound by any duty of confidentiality towards the girl. And there was laughter from the bench when Mr O’Neill showed them Scottish Government guidance saying the Named Person would also have input into the diet of children as well as decisions on the decor for a child’s bedroom or the TV programmes they watch. 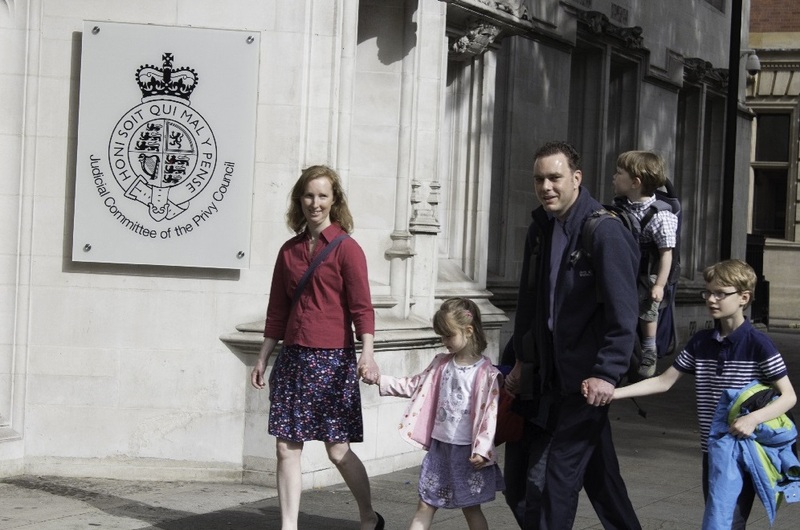 The QC said campaigners were objecting to the compulsory nature of the scheme which does not allow any opt-out for parents. He told the judges they had a duty to “enforce and police” the limits of the Scottish Parliament. He also said the Named Person scheme meant they would be given rights and duties to carry out functions normally carried out by parents adding: “It is going beyond the state’s role. The state is not the totality. And he said the state “should not undermine the family”. Asked by Baroness Hale what might happen if a Named Person expressed concern about parents smoking in the family home where there were children present, the QC said the Named Person could bring in health visitors and social workers with the matter possibly being escalated to a multi-agency matter and a child’s plan drawn up to deal with the matter. And he said the Scottish Parliament and those drafting the legislation had failed to consider European law in the process. The legal challenge is being brought by a coalition of groups, spearheaded by The Christian Institute, CARE (Christian Action Research and Education), TYMES Trust and the Family Education Trust. Clan Childlaw, a charity providing free legal advice to young people in Scotland, is intervening in support of the legal action. Last year, judges from Scotland’s highest court ruled that the Named Person legislation did not conflict with human rights or data protection laws. But NO2NP say Holyrood has exceeded its powers and breached European rules on data protection. At the Supreme Court, five judges – Baroness Hale, Lord Wilson, Lord Reed, Lord Hughes and Lord Hodge – are considering legal submissions in a two-day hearing. Lord Reed and Lord Hodge are Scottish. The hearing will continue tomorrow at 10:30am and can be watched live on the Supreme Court website. 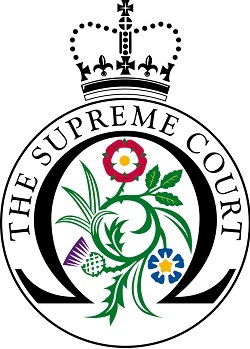 This morning proceedings will begin at the UK Supreme Court in London in the continued fight to oppose the Scottish Government’s Named Person legislation. Last year judges in Scotland’s highest court ruled that the legislation did not conflict with human rights or data protection laws. But groups and individuals involved in the NO2NP campaign appealed the decision, taking the case to the Supreme Court. The hearing will last two days and be heard by five judges. Watch the hearing live from 10:30am on the Supreme Court website. There has been continued widespread media coverage on the Named Person issue in recent days, including articles in The Herald, The Scotsman, the Scottish Daily Mail, the Scottish Daily Express and on the front page of the Scottish Daily Telegraph. Keep up with all the latest news coverage via our social media pages on Facebook and Twitter.